"... A person may not enter a private sewer into the sewer pipes and conduits of the public sewer until that person has obtained a permit in writing form the District and has conformed to the Rules and Regulations of the District. All such permits must be recorded by the District's clerk before the same are issued." 1. 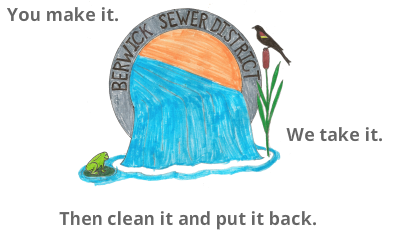 Before applying for a building permit, the Notice of Accessibility to Public Sewer must be filled out by, submitted with plans, and reviewed by the Berwick Sewer District. This application can be downloaded below or picked up at our office. Once this document has been completed and reviewed, it must be submitted to the Town of Berwick Planning Board with the building permit paperwork. Download the Notice of Accessibility to Public Sewer by clicking HERE. ​2. After obtaining a building permit, the Sewer Connection Application must be filled out and returned to the district office with all fees. The application can be downloaded below or picked up at our office. The Berwick Sewer District must be contacted at least 48 hours prior to connection. This is in order for us to make the connection to the main line and to inspect installation of the sewer service line to the building. Download the Sewer Connection Application by clicking HERE. "All costs and expenses incidental to the installation, connection, and maintenance of the building sewer shall be borne by the private property owner(s). The owner(s) shall defend, indemnify, and hold the District harmless from any loss, property damage, and/or personal injury (including death) that may directly or indirectly be caused by or related to the installation of the building sewer." These requirements are governed by the Berwick Sewer District Sewer Standards, Section 14, Part 2.1. For a copy of the Sewer Standards, please contact us. ​Upon discovery of a blockage, the private property owner shall immediately contact the District.